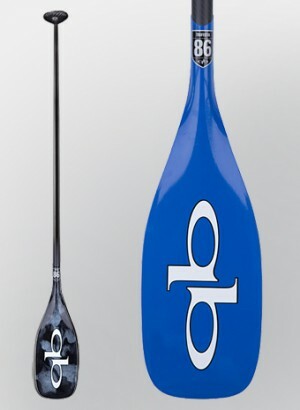 The super smooth exit and entry make this paddle one of choice for many distance paddlers. This high quality hybrid construction is the same paddle as the carbon version making it good for all casual and serious racers, adventure paddlers and surfers. With it’s increased flex, the paddle is great for those having any shoulder or wrist issues. The flex is also good for our surfing paddlers. This hybrid version is available with our Flyweight Shaft with only an EVA wrap grip as well as our new RT85 with only our full carbon grip. Both these shafts carry an SSI of 35 that various by length of the paddle. At the 2013 Battle of the Paddle, Travis Grant stood at the start of the distance race a little unsure about paddling in the event with a torn knee. At the end of the race, he gingerly stepped off the board and limped up the sand in first place holding up a paddle that no one in the crowd recognized. Little did everyone watching that heroic performance know the paddle he used that day was a prototype that would become the Trifecta.